The start of my new career as a cub reporter was fraught with difficulty from the outset. Normally cubs have a leader to look up to, in my case I was literally thrown to the wolves. My Romford employers were not strictly newspaper publishers but advertising agents. All they wanted was some Basildon news, which in turn might encourage more local firms to advertise. The job had no definite remit. I was to get round the town, find what news I could, then take the typewritten copy to Romford once a week. The money was appalling although expenses were paid. I was introduced to Ken, the advertising manager for Basildon and district. He was a native of the area, resented newcomers, and in his capacity as a Vange councillor always had complaints to make. However he did take me about on the back of his Vespa scooter, mainly to all the local hostelries (I was, and still am, a non-drinker) and a few of his 'mates' on the Council. Nevertheless I soon discovered the places or people that needed to be contacted on a weekly basis: the Police Station in Pitsea; undertakers; clergymen of various denominations; local schools and Billericay Court every Tuesday. These visits took up quite a bit of time but I was also busy keeping my eyes and ears open in a bid to find other local interest stories. The lack of transport was a bind and I was thrilled when Ken told me the employers were buying me a scooter. One of the reporters on the Southend Standard had a new Lambretta (sometimes giving me lifts back from Billericay Court) and this is what I hoped for. Fortunately, by then there was a bridge under Clay Hill Road into the rapidly expanding Town Centre. Unfortunately my mean machine turned out to be the largest size Vespa, extremely heavy and very beat-up. Frankly, I was terrified of the thing and it didn't take me long to have an accident. On my way back from Romford, having handed over the weekly quota of news, I braked sharply when a car in front took a sudden left turn. I fell off, landing in the road. On close examination I was OK but the scooter was quite badly damaged as it skidded across the tarmac. Somehow I managed to push it home and phoned Ken. When he came round to collect the scooter he brought the surprising news that the Romford paper had been taken over. In future both of us would be working for the long established Recorder Group in Leytonstone, which owned the Laindon and Basildon titles. The Laindon Recorder office was situated in the High Road right next door to the Fire Station in what was then only a village. It was lovely to have a base at last and to learn to be a proper reporter. It was thanks to the editor, Alf Smirk, that I did develop a modicum of skill. An ex-Sunderland and Southend United professional footballer, Alf was an unforgettable character. A chain-smoker and heavy drinker with a very bluff manner, he knew a lot of oaths spoken in a gruff northern accent that a previously well brought up girl had never heard. He also possessed a legendary 'blue pencil' and was not averse to crossing out chunks of my carefully worded prose as it was 'too b....y long'. In those days everything was put down on a manual typewriter and any kind of 'edit' meant typing the blooming thing out again. It didn't take me too long to learn how to cut things short. Alf Smirk also taught me another valuable lesson when it came to local paper reporting. 'Make sure you get their b....y names right'. This was particularly important when compiling reports of those who had attended funerals and woe betide the reporter who left a name out - that unnamed someone would be bound to come into the office and complain. Similarly long lists of winners at school sports days or horticultural shows had to be 100% accurate. 'Everyone likes to see their name in print so we sell more copies that way', Alf explained. Every week one of the Laindon based reporters had to accompany Alf to the Leytonstone office and help put the paper to bed. I loved it when it was my turn as this was the scene of my childhood dreams. The atmosphere was stifling as hot presses rolled and there was the unforgettable greasy smell of newsprint. Late news items had to be proof read from the long galley slips as they were peeled off the compositors' trays. However journeys back to Laindon with Alf Smirk driving were often hair-raising and, like his language, appalling if any other driver upset him. I can still remember hanging on tightly to the door handle, or the edge of my seat, seat belts were not in vogue those days. My editor's road 'skills' help one news story to stick in my memory. This was Prince Philip's visit to Basildon on March 4th, 1960. He was due to tour the site of a new development in the Town Centre. Then he would go on to Carreras, the cigarette factory on the Industrial Site, where he was to accept a cheque on behalf of The Playing Fields Association, of which he was patron. It was not a happy day. I had drawn the short straw of waiting in the Town Centre for the Prince's visit whilst Alf and the photographer went to Carreras where 'hospitality' had been laid on. Unfortunately I had been suffering badly from a tooth abscess and one side of my face was twice its normal size. Trying to get near to a builder with whom Prince Philip had spoken I was aware of a voice asking me: 'What the devil are you writing down?' It was the Prince and I could only mumble a reply. Matters were not helped as I waited for Alf's return, because we had to dash to Leytonstone to get the stories in the following day's paper. It got later and later, it was freezing cold, my mouth was killing me and I felt like murdering my editor. When he eventually arrived it was obvious he had over-indulged in the liquid hospitality department and the journey was a nightmare - it was a wonder we got back in one piece! 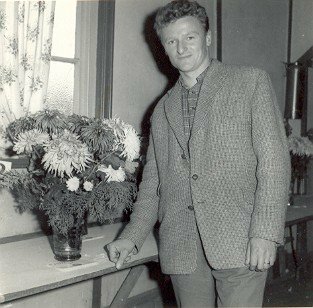 Marion's husband Fred standing proudly by his prize blooms. Photo: © M. Hancock. Reproduced by kind permission. All the time I was becoming more proficient at disseminating the wheat from the chaff, where news was concerned, Basildon was growing up around me. We had new schools, new churches, new community centres and - most important - new shops. One parade had opened just round the corner from our house in Codenham Straight and this saved much precious time. My husband, Fred, was now working in Basildon and he wanted his meal on the table when he got home, not two hours later. He had taken to gardening like the proverbial duck to water, becoming an addict where chrysanthemums were concerned. Despite the smallness of our plot it was soon taken over by bamboo canes and brown paper bags. He had been with me to a Laindon Horticultural Show and was amazed at the blooms that could be achieved by careful nurture. When he entered several classes the following year and practically took a clean sweep of the medals there were many old-timers who were not pleased. But the long-time chrysanthemum champion, a Mr Lucas of Langdon Hills, was an exception. He invited us to his smallholding, where his son also bred mink (I got an interesting article out of that) and generally helped Fred grow even better plants. Mr Lucas was a very worried man, as he knew that his land was to be incorporated in the New Town's plan and he didn't want to leave the home he had known for years. When we moved away from Basildon, some four years later, development of that part of Langdon had only just begun.